Combine rice flour, potato starch, tapioca flour and salt in medium bowl. Shape dough into ball and divide in half. Cover half with plastic wrap; set aside. Place remaining half on lightly floured (use rice flour) sheet of wax paper. Top with additional piece of wax paper. Roll out dough to 1/8-inch thickness. 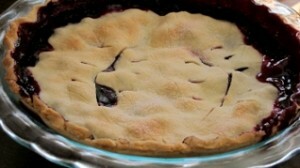 Remove top sheet of wax paper and invert dough into 9-inch (4 cup) pie plate. Slowly peel away wax paper and trim excess crust.